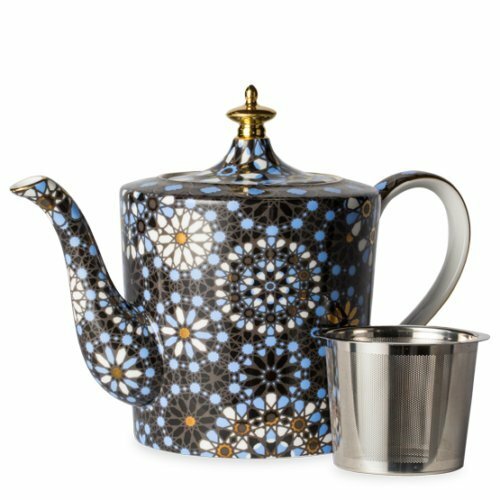 T2 Dazed and Dazzled Black Indigo - Fine Bone China TeaPot - 30.43oz • Material: Fine Bone China, Stainless steel infuser. • Gentle hand wash, NOT suitable for microwave or dishwasher. • Dazed and Dazzled Teapot Ultra exotic with a darker, more mysterious feel, our beloved Dazed & Dazzled range is back in a cosy winter edition. With four colours that pop against the black and gold details, this full fine bone china range also brings with it the first porcelain Dazed & Dazzled teamug with infuser! If you have any questions about this product by T2 Dazed and Dazzled Black Indigo - Fine Bone China TeaPot - 30.43oz, contact us by completing and submitting the form below. If you are looking for a specif part number, please include it with your message.